Frameworks for teaching, such as this inquiry model, help teachers and student gain understanding of the process and product. This is guided by an essential question or problem that needs to be solved. Throughout this course you will gather and organize information from your readings, collaborations, and observations with others to consolidate your own understanding through conversation and applications. Applying the use of a concept map can help bring clarity to your ideas and build connections to complex concepts. Your students can also use concept maps to make their thinking visible. 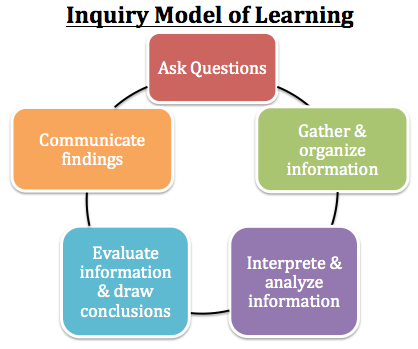 Alternate models for inquiry learning are presented on the ﻿Napier Central wiki site﻿. These include the Trevor Bond - SAUCE model, the Alberta model, the Lane Clarke model, the Jeni Wilson & Kath Murdoch model, and the Stripling model. Reviewing various models for differences and similarities can deepen your own understanding of inquiry learning. Capacity Building Series: Collaborative Inquiry in Ontario, Sept. 2014. Capacity Building Series: Collaborative Teacher Inquiry, Sept. 2010. A classroom experience with inquiry based learning is shared on this teacher's blog site: Inquiry Based Learning for Teachers. There is a series of eight videos titled An Approach to Inquiry posted on the Ontario Elementary Social Studies Teachers Association modelling how inquiry works in an elementary classroom. Strategies and resources are shared. Making Sense of Inquiry-Based Learning: An Ontario Perspective (Michelle Cordy, Nov. 30, 2014) provides many relevant links and insights in how inquiry links to the Ontario curriculum documents and pedagogical approaches. "Inquiry is at the heart of learning in all subject areas" so is an essential pedagogical approach to teaching and learning within a digitally rich classroom environment. Inquiry education in Alberta is also shared on this blog site: Glendale Inquiry .... as well as this resource site for educators in Alberta - Alberta Education: Improving student learning > Inquiry based learning. The Canadian Educators Association has a one page document outlining the issues and insights on the topic: Is Inquiry-Based Learning Effective? This page also has relevant links and references for further inquiry into inquiry learning. The Galileo.org site provides a page on What is Inquiry? that provides some essential elements for clarifying understanding. These elements include - authenticity, academic rigour, assessment, beyond the school connections, use of digital technologies, active exploration, connecting with expertise, elaborated communication. This page also outlines some differences between projects and project based learning that fosters inquiry. Inquire Within is a blog site where a collection of educators from around the world focus and share their inquiry and work into inquiry learning. Inquiry into Digital Teaching and Learning - What is Educational Technology? Outside the Skinner Box: Can Education Technology Make a Course Correction? Written by Gary Stager, Winter 2015. This article presents two myths - that technology is neutral, that technology changes constantly - and explores them in current educational contexts. Giving students 'agency' over learning is one expected outcome of technology. Three 'game changing' technologies are further explored in this article - personal fabrication, physical computing, and computer programming.